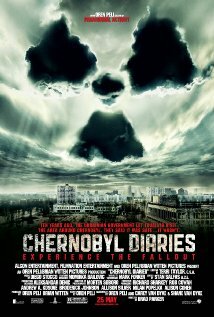 Chernobyl Diaries is really nothing that special. Natalie (Olivia Dudley), her boyfriend Chris (Jesse McCartney), his brother Paul (Jonathan Sadowksi), and a friend Amanda (Devin Kelley) are all vacationing in Europe. When Paul hires an extreme tour guide (Dimitri Diatchenko) to take them up to the abandoned city of Pripyat, the former home of the workers of the Chernobyl nuclear reactor, they’re intrigued and most of them want to do it. They think they’d just have to worry about the dangerous levels of nuclear activity, but they are very wrong. The general background of the film is pretty interesting, and gave me knowledge of something I hadn’t really heard of before. If my research is correct, the general background is as follows: in 1986, an unstable nuclear reactor at Chernobyl exploded, releasing much radiation, causing the immediate death of two workers at the scene, and the death of twenty-eight other workers because of radiation poisoning. The beginning is quite promising, but then it just gets to be a little silly and quite stupid. The storyline seems original, and the background information is nice, but it doesn’t execute itself well; and I’ve really seen all the contents in this film before. It’s just a messy screenplay. Some of the scares are actually pretty big; but others are just really expected. The acting isn’t very good at all, and a lot of the characters were irritating. As my first experience for a horror film shot in a found footage format, it was decent. I was entertained more by, say, The Blair Witch Project, but I didn’t really like that one that one a lot, so that isn’t saying very much. It does look less amateurish than T.B.W.P., or some other found footage flicks, so that’s a pretty good aspect. The film also stars Ingrid Bolsǿ Berdal, and Nathan Phillips. It’s only an okay movie, it has some entertaining content but there isn’t anything great.